Mcent is a free recharge app which provide free recharge for downloading and using the offer apps.This free recharge app is since long and if you have not tried it yet then it is right time to start because they are now giving Rs 5 as a welcome bonus and Rs 40 per referral. Just refer your friend to mcent and make him to download at least 1 offer app there you will get Rs 40.Earn unlimited recharge money by our Exclusive Mcent Trick. Old user will get Rs 40 per referral and new users will also get Rs 40 per referral. We all know mcent gives lots of referral money and points when we downloads an app through mcent. Today I am Sharing a Mcent trick with you through which you can transfer Mcent money from one mcent account to other. If you have old version then update your app. and you can use this transfer feature in the app. 2. 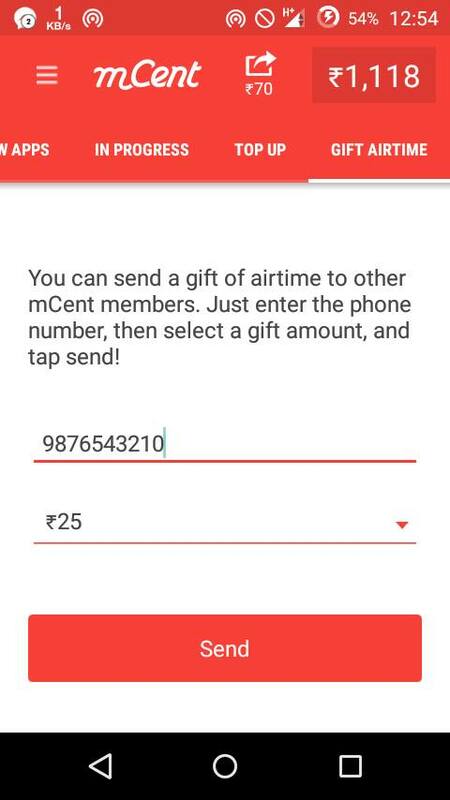 Go to Gift money in your Mcent app. 3. Enter mobile no. to which you want to transfer your money. 4. Select amount and Click on Send. 5. Money will be transferred into your friends mcent wallet. It is win-win situation for both. You will get Rs 40 for referring your friend and your friend will get free talktime for downloading offer apps. 4. You will be redirected to playstore and download mcent. Repeat the steps to earn unlimited,but each time you need to have new unregistered mobile number. 468 Responses to "Mcent Trick – Earn Unlimited Free Recharge | Refer and Earn Trick"
the reason could be they tracked your virtual device and hence restricting you to access mcent account. haan kaam kr rha hai.